When it comes to designing and decorating a nursery or children's room, I've always struggled with the juvenile themes and garish colors that often are used. Last week, my friend Teresa and I stumbled into Restoration Hardware's baby and child store. We were both amazed at the very original, quite unpractical, yet totally gorgeous nurseries and rooms displayed. 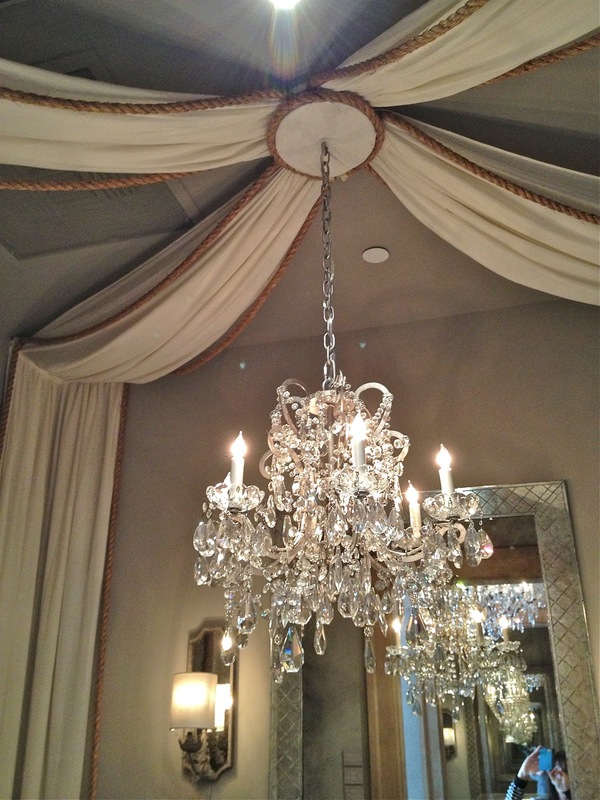 Ethereal canopies and crystal chandeliers everywhere! It was a feast for the eyes! This store could make you want to have a baby! 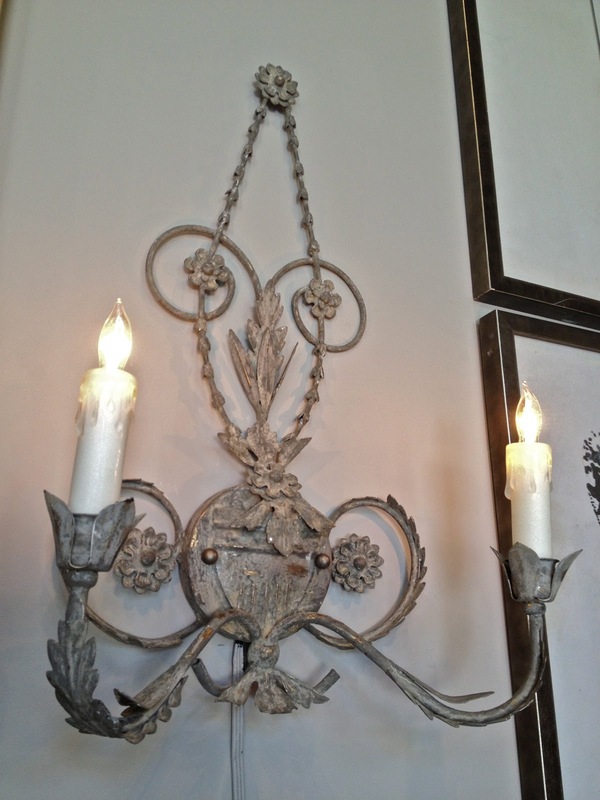 Apart from the cribs, much of the merchandise could be used in any room in the house, like these crystal sconces and patinated mirror. Even the fashion drawings would look great anywhere else in the house. 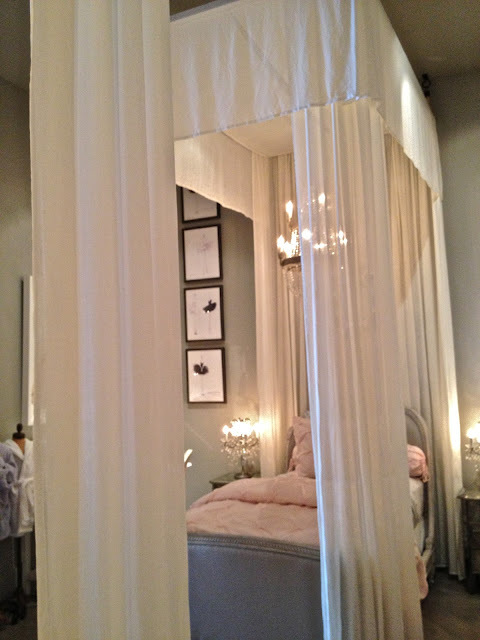 We were especially taken with the little girl's room with matching twin canopy beds hung with chandeliers. 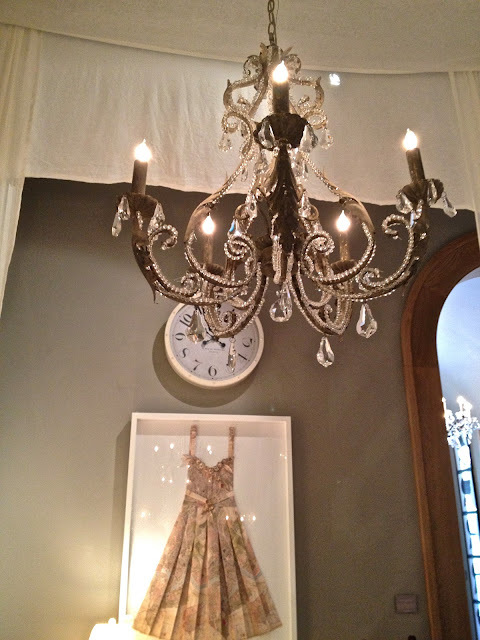 Then, we noticed the framed dress on the wall. 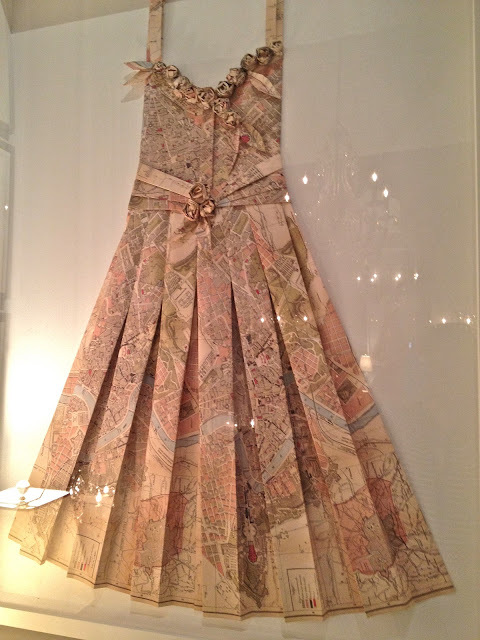 A closer look revealed that it was made from a map of Paris! Ok, now that's just amazing! Expensive, but it would be a forever treasure. We both found ourselves reminiscing about the nurseries and rooms we designed for our own kids back in the day. My first nursery, in 1976 was painted bright yellow with a white crib. Eight years later, a boy's nursery with a dark wood crib and red, white and blue bedding. By the time the third child was born, she slept in a port-a-crib in the hallway! It wasn't until the fourth child that I got to really decorate a nursery. When we moved in to that house, the room was already decorated in aqua and yellow polka dot wallpaper. I embraced it! However, it was just too cutsey for me. I actually have a Pinterest board titled, "Sleep Tight Little Ones." There aren't a lot of pins on this board because I'm always looking for tastefully decorated rooms that can take a child from toddler to teenager. Here are a few of my favorite pins as an example. 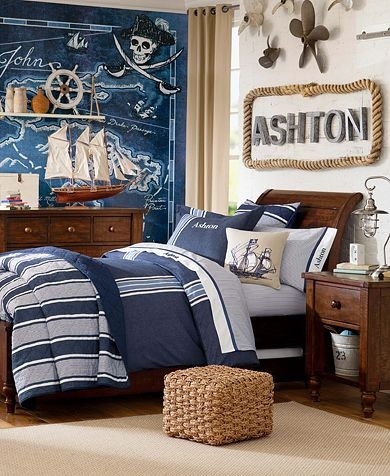 This boy's room from Pottery Barn Kids is a little juvenile, but I'm guessing it would be perfect for a 6 year old. Take away the mural when he is 16 and it transitions easily. The neutral wallpaper and rug will take this little boy well into his high school years! It's fun, without being cutsey. The colors are neutral and classic. 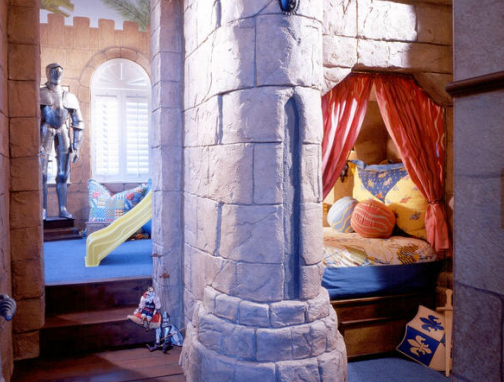 A boy's room designed by Kristen Buckingham, as seen in Elle Decor. Change out the duvet covers and you have a nice guest room when he goes away to college! 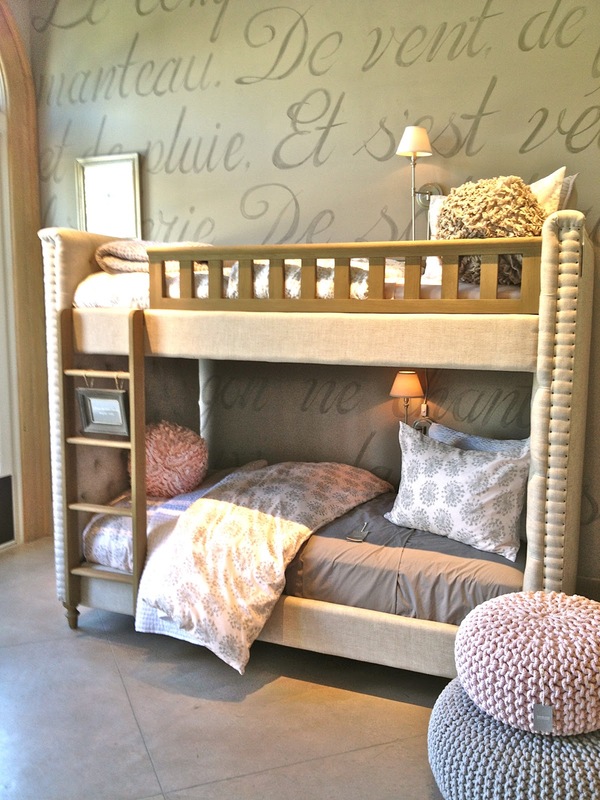 Leave it to Restoration Hardware to design a girl's room with an upholstered velvet daybed! In gray! 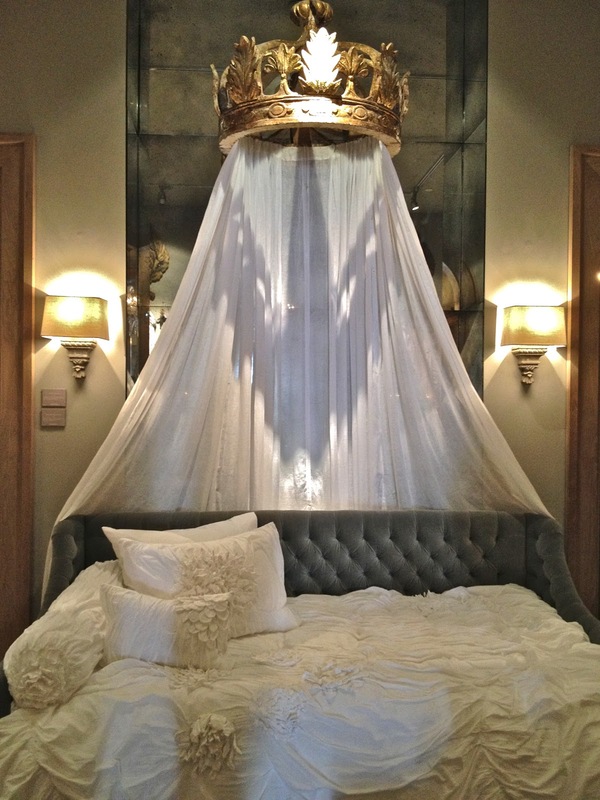 I love the corona, the sconces and the canopy! This would be a beautiful room for a teenage girl, transitioning to guest room when she goes away to college. We were amazed by the upholstered bunk beds! I thought they would be fantastic in a bunk room. I could imagine two sets of them--you know, when you have lots of grandkids spend the night! Which brings me to my latest project. Redesigning the bedrooms upstairs that belonged to "the kids." That means boxing up baseball cards, fossils, souvenirs, Beany Babies, posters and books. One of the rooms will have twin beds for when the granddaughters spend the night. I'm trying to make it age and gender neutral, yet give them a room they can call their own at grandma's house. Meanwhile, if you ever find yourself in Corte Madera, check out RH baby & child for inspiration. RH has wonderfully innovative furniture and designs for kids. You can check it out on their website here. 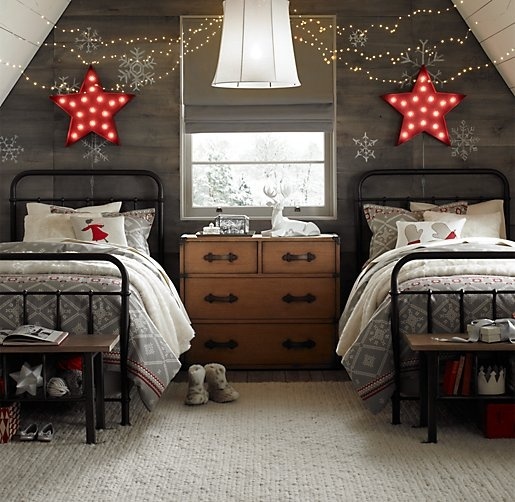 For more children's rooms, visit my Pinterest board, "Sleep Tight Little Ones" here. Good Afternoon Delores, Oh my, I think I am in love, I adore the crystal chandeliers and wall sconces, they are absolutely beautiful. I love soft colours in my living room, but in my kitchen and dining room I love yellow with a splash of red. I think it is because a soft yellow works well in our English climate and red....well it enlivens me on dreary days. That paper dress wouldn't be expensive. 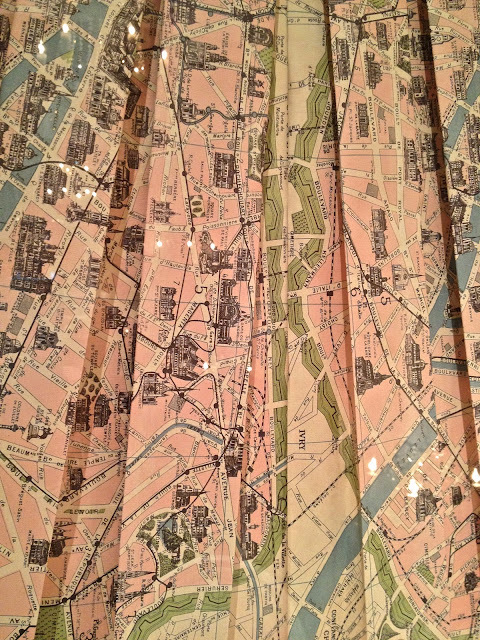 Those Paris maps (and other cities also) are for sale in lots of stores. Just buy a half dozen of them and start folding. I am working on 2 bedrooms for my grands in my home just now. I do love color so both rooms are a favorite shade of green and both have yellow carpet. The girls' room is all soft pinks and has some vintage finds and I even have dresses over their beds. Mine are not folded Paris maps though, that would be stunning. Can't wait to see what you do. I know it will be lovely. Just beautiful! I also don't do themes, well now that my tastes have grown LOL my 12 year old son went through his share of themed rooms probably until about 7 thats when I banished them LOL Now I'm working on his teen room since he and the baby switched rooms and we had to get him a bigger mattress. 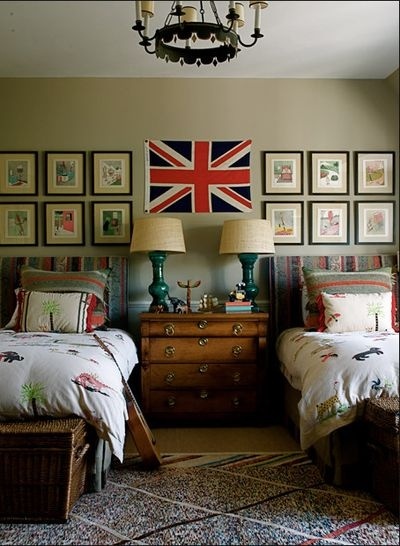 I love your inspiration photos and the union jack is my favorite! My daughter had a vintage brown and pink thing going on in her nursery as soon as I finish with the boys room I will start on her big girl room. Wow I rambled! I can't wait to see how your room turns out, I know it will be beautiful. Wow! I have a whole new appreciate for Restoration Hardware! Those rooms are to die for! I have never liked themed children's rooms either! They make me cringe! You showed some fabulous examples! Boy if you are going to be a baby...this is the time! Kinda makes me want to regress and be 6 months old again:) Babies rooms have never looked this good and sophisticated, and I am so with you...hate theme rooms...so over that whole look. Did not realize RH had a baby store. The photos are wonderful and I am in love with the upholstered bunk bed photo everything about it is a perfect transition room. Such a fun post. So smart to have a baby's room "travel" through childhood. Can't wait to see what you do with the room. While I find they the RH children's rooms pretty to look at, they are so boring for the kid! Kids do need color and things that are interesting to them in their space. My boys (ages 5 & 7) have a huge, mostly blue world map on one wall & a giant driftwood peace sign on another wall. They have a book ledge filled with colorful books by their beds. An all neutral room would not inspire any imagination! Also, kids are only little for such a short time, why not let them have a fun room? I so agree with J Keppel. Color is a part of growing and kids do have their own ideas. Cultivating imagination is much more important than a grownup room for children. 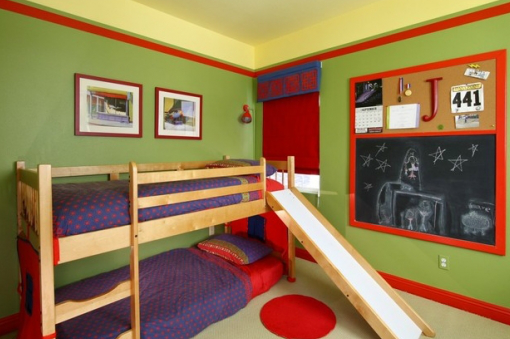 Having said that, my son (34 now) had a red, blue and yellow room with a chalkboard wall when he was young. When he was 8, he wanted camo tent flap curtains and room for legos. At 12 he wanted a black and white room that looked like a NYC loft. It was fun to do. And now, his room is being turned into my husband's office who wants it to be red, blue and yellow!